Happy Saturday! The medallion is finished! Actually I completed it several days ago but wasn’t able to bask in the joy of it at the time. I was really grateful as I went on this portion of the pattern to have my interchangeable needles. I now have a set of both the standard interchangeable and the short needles, which allowed me to work my way down more gradually in circular needle length. First was due to the extreme and mentally exhausting week I had a work. Did you hear about the Amazon.com based server outage earlier this week, on Tuesday? It had a huge systemic impact on the company I work for and resulted in lots of frustrated employees and even more frustrated customers and was followed by a lesser reported L3 outage on Thursday. And this was only 2 of many issues that started Monday morning and followed us all through the week. Some technology related, some co-worker/gossip/drama related (Personally, I avoid drama at all costs, but sometimes it can’t be helped). All of it was physically and mentally draining. It truly was a week from H-E – Double Toothpicks! And second is the cautiously optimistic (with a side of pending doom) feeling I’m experiencing about the results of the medallion. There are puckers at the bottom which are probably due to going down a couple of needle sizes (my choice and a recommendation of project comments on the pattern). And overall I am just not sure how it is going to look in the end. So today I have decided to block it. Right now it is only the body. But rather than wait till everything else is complete and block all at once I am doing the body first so I will know if I’ll have to frog the medallion and start again, perhaps going up a needle size. Do you block as you go or once everything is complete on multi-piece projects? In the meantime I have completed the 2 cuffs. 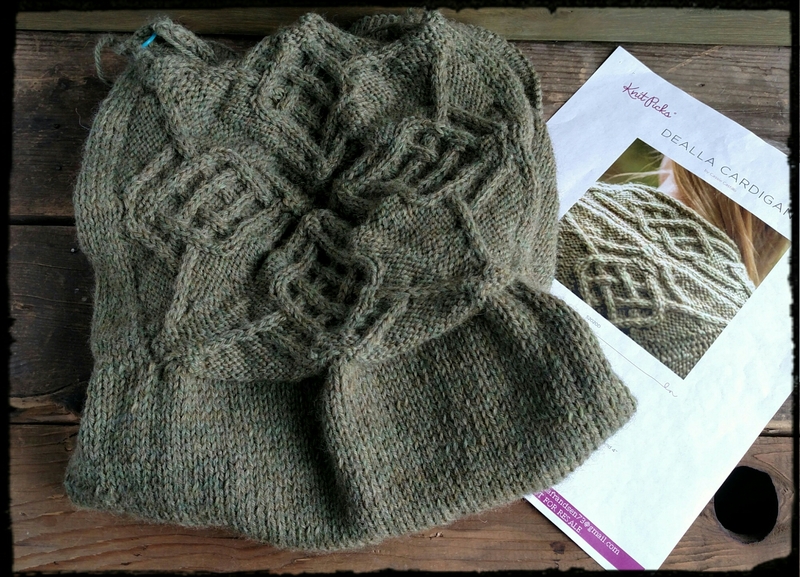 The pattern calls for the sleeves to be knit flat rather than in-the-round and then pieced together later. I’ve contemplated putting them on circulars to avoid the finish work later and even sewn the ends of the cuff together on the first one, but I am not that confident yet in my abilities in detouring from the pattern so the doubt has set in – again. I’d really like to complete both sleeves at the same time using the magic loop method but it is not something I have tried yet and I’m not sure that this is the time to start. So my current stance is to follow the pattern – this time! And before I start another cardigan or sweater, learn magic loop, probably on a sock pattern. So here is my question for you. 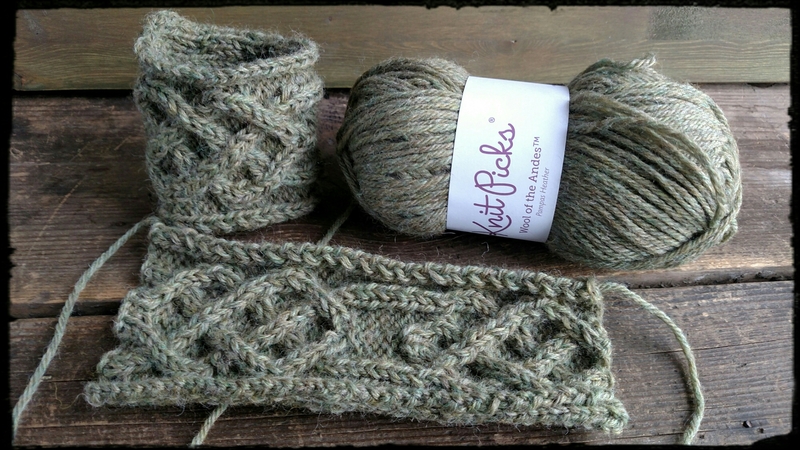 For those that knit using magic loop, would you recommend starting with one sock at a time or is it just as easy to start with two?